I added more pictures of DIY Flight Sim completions to the new expanded Customer Gallery. Note there are now three distinct examples of customers adding the popular Thrustmaster Warthog HOTAS joystick to the #F321 DIY Center Joystick Frame. Several customers modified the #F321 Center Joystick project slightly to accommodate the Thrustmaster Warthog joystick. They did this by shortening the center joystick stand by several inches and then bolting on the joystick. The Thrustmaster Warthog originally comes with a flat, square base which can be easily removed. Notice that the DIY Center Joystick Frame works well with Saitek rudder pedals because of their wide stance. You can comfortably straddle the center joystick to reach the pedals. 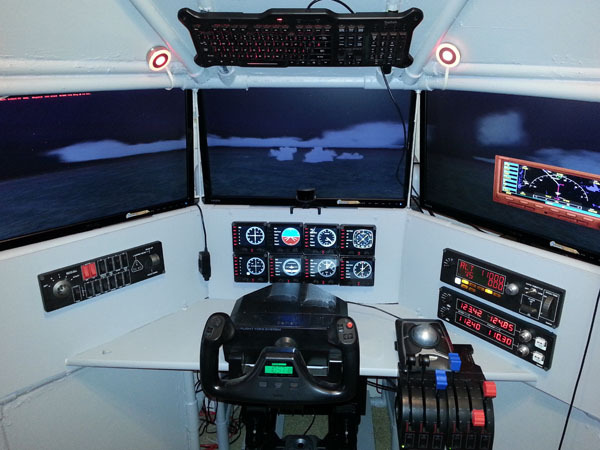 Note the Saitek Combat Rudder Pedals installed on the #F321, but you can also use the Saitek Cessna Rudder Pedals. 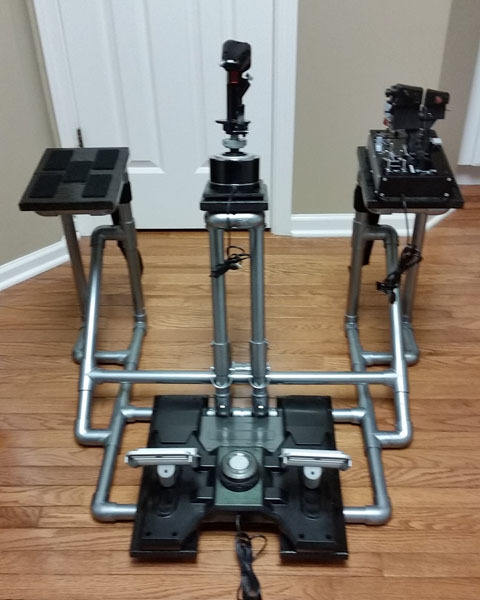 I originally designed the #F321 project around the early model Saitek Pro Flight Rudder Pedals, witch still work well. You can use the CH Rudder Pedals but they are difficult to use because they are narrow and makes it harder to straddle the center joystick stand. Center Joystick or Side Joystick? Check out Craig’s pictures in the new Customer Gallery 2. 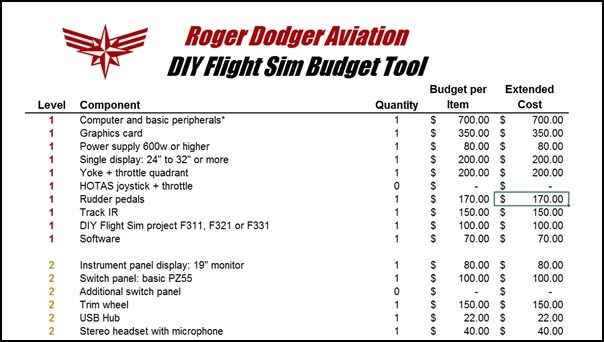 Craig created one of the most attractive DIY Flight Sim completions. He built the #F321 with a removable center stand and with side stands on both sides. He can now switch between a traditional center joystick and a HOTAS side joystick. Notice the D-ring fasteners he uses to attach the center stand. 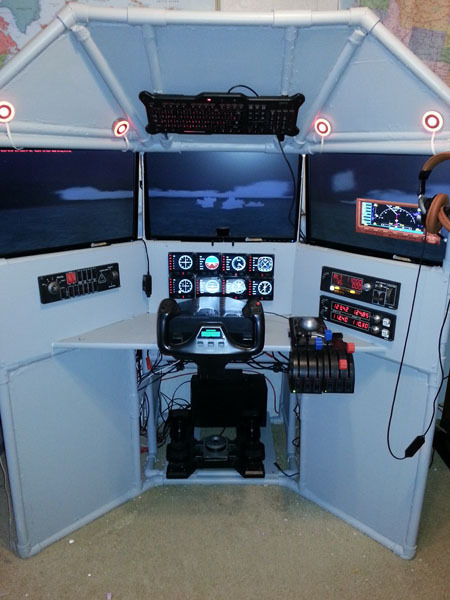 Rob modified the #E420 DIY Roll-Away Flight Sim to match his needs and style of flying. 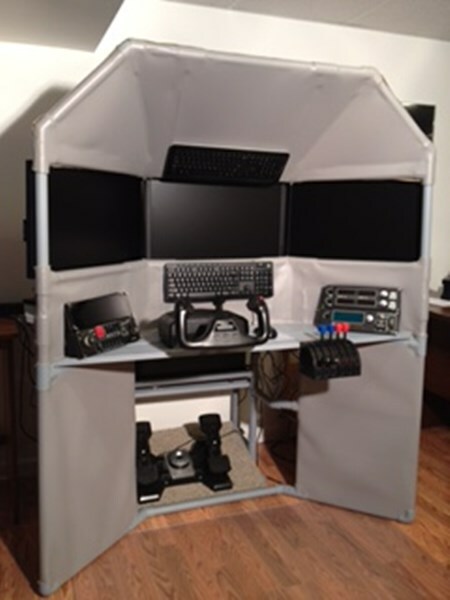 He added an expanded mid-shelf for the Saitek yoke and throttle quadrant and a swing-out platform for the compact mini-keyboard. Also note the additional platform for the mouse and mouse pad. 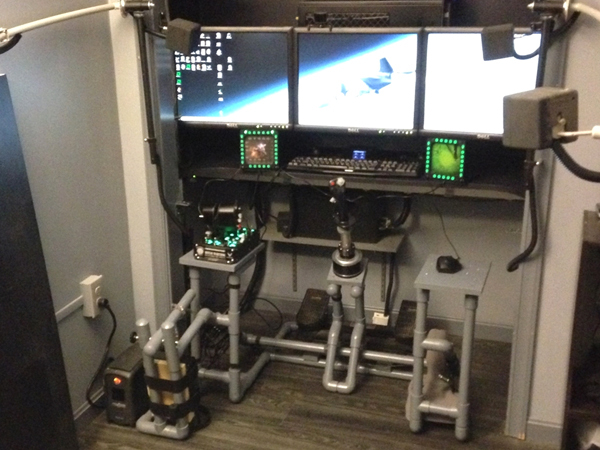 The Roll-Away Flight Sim frame is wonderfully mobile because Rob installed four castering wheels to it. Two of the castering wheels can be locked in place so he can comfortably use the rudder pedals without worrying about the frame rolling away. 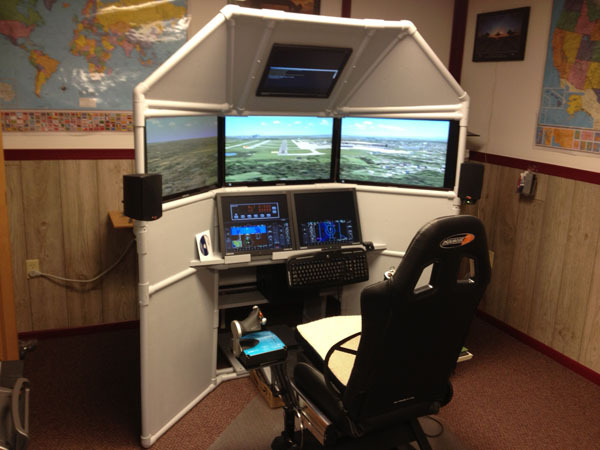 You should always use rudder pedals, they are an important part of DIY Flight Sim completions. Great to see this innovative build from Ola! 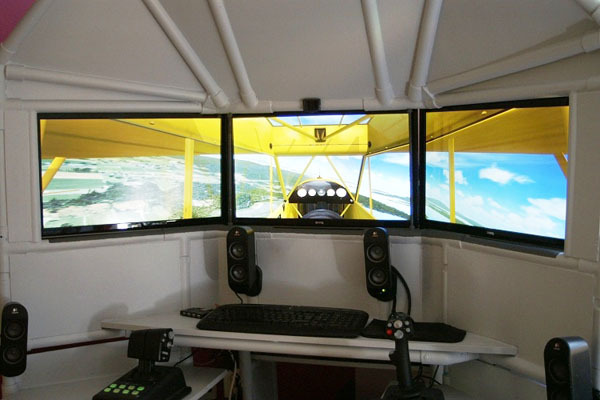 He made several modifications to the DIY Triple Screen Flight Simulator project to better match the type of flying he enjoys. You can see from the screen shot he is flying a Piper Cub over the summer countryside. 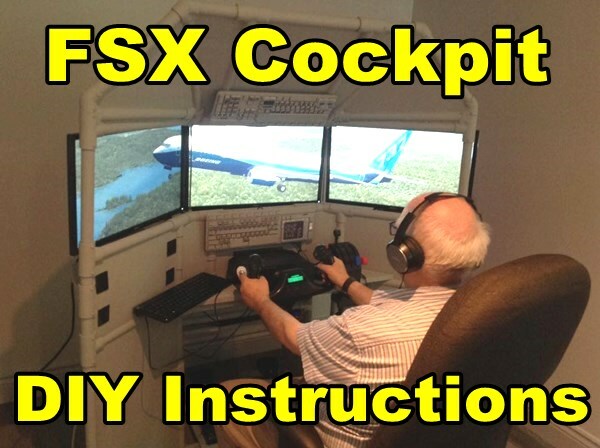 He is also running Flight Simulator X. 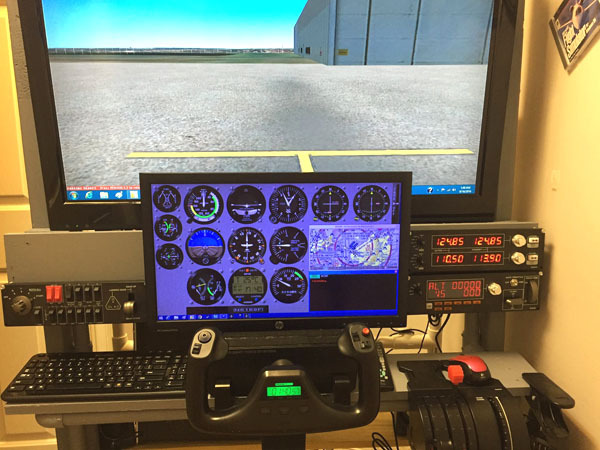 The stock project from DIY Flight Sims calls for a yoke and throttle quadrant, but Ola designed two podiums on either side that support HOTAS (Hands On Throttle and Stick) flight controls. I fully support modifying the designs to match your needs. It’s exciting to see all the variations that builders can create. 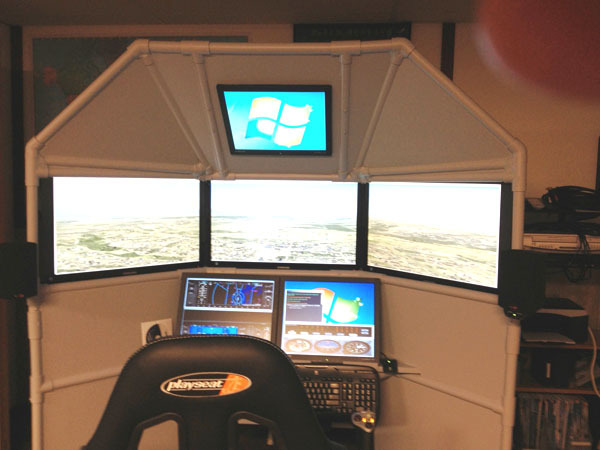 I never predicted I would see a Triple Screen Flight Simulator with HOTAS. Ola is using the Logitech G940 HOTAS flight system with his home flight sim cockpit. I’ve always wanted to try out this system but I haven’t had the opportunity yet. I’ve owned lots of Logitech products and I’ve always been pleased with their reliability and affordability. For some reason, I’m not finding this available on Amazon or Newegg. Amazon actually does have it listed at $620 USD, which is way too expensive, but could be an indication this product is discontinued. I hope it’s not discontinued, but it is a force-feedback joystick, and it’s hard for those to sell successfully in the already competitive joystick market. 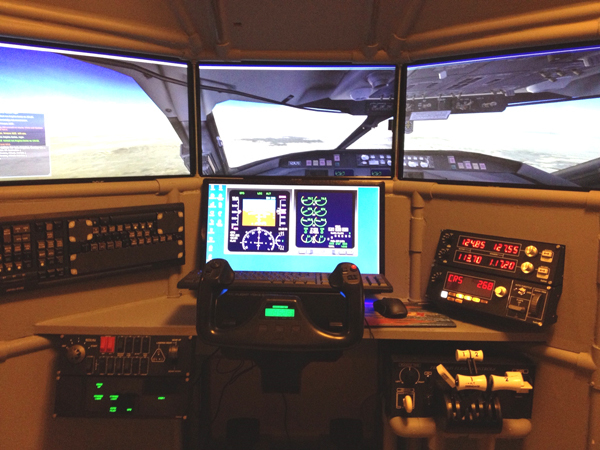 Especially relevant are the 2″ Velcro strips on either side of the triple screen flight simulator with HOTAS. 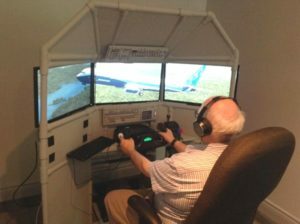 You might not know this unless you’ve experienced it, but if you use rudder pedals while sitting in an office chair, you immediately find that pushing on the pedals, results in you rolling away in the chair. The remedy is to strap the chair in place with sturdy Velcro strips. Most of all, you literally get to “strap in” when preparing to fly your simulator. 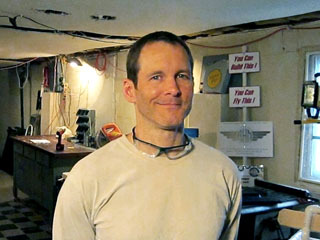 One of the best things about the Do-It-Yourself ethos is seeing all the ways people adapt the designs to fit their specific needs. 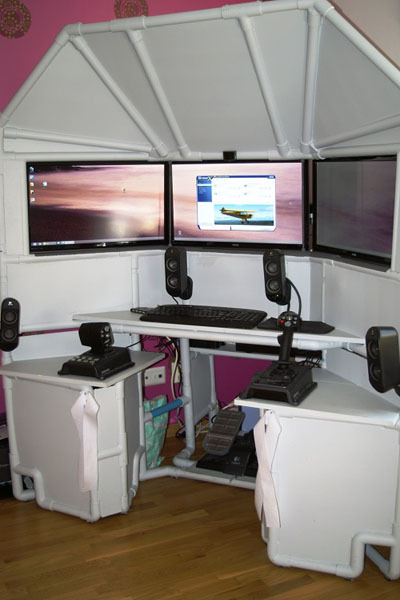 Most noteworthy is this DIY six screen home cockpit built by my customer, Ted. 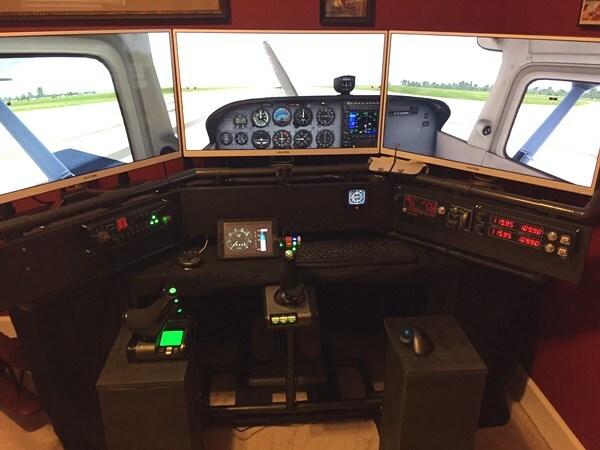 He started with the stock DIY Triple Screen Flight Sim plans and adapted it to include larger monitors, and he added two auxiliary monitors for the instruments and a top monitor for the overhead switches. It looks like he also built a custom gaming chair from a racing seat. Look at the PVC pipe frame and how it is not restricted to only 90-degree and 45-degree angles as is so often the case with PVC projects. I invented a new building process for joining the PVC pipes together which opens up a world of options for innovative design. Check out other customer completed projects in the Gallery. 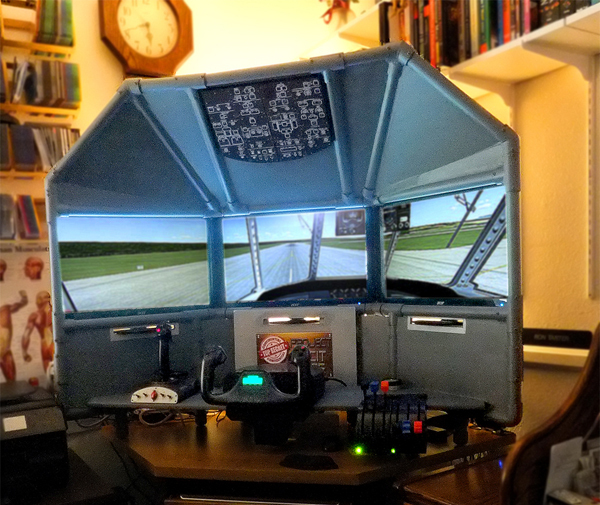 The DIY Triple Screen Flight Sim video and instruction manual has grown over the years. Originally, I produced it and donated it to the National Airline History Museum. It is a fun, interactive, hands-on experience for the museum guests to fly a simulated vintage airliner. 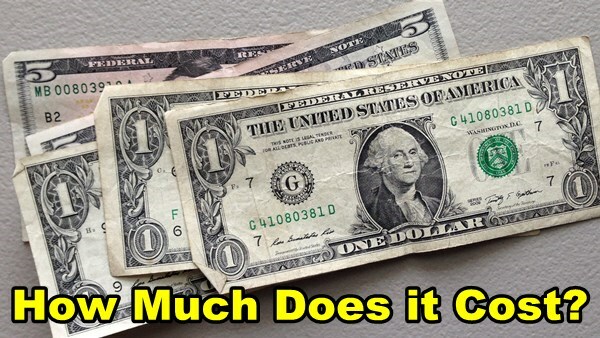 Most noteworthy, they are still using it after 5 years! 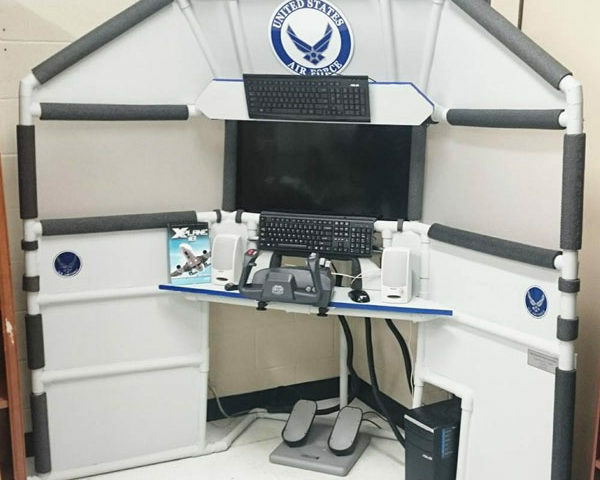 I also spearheaded the first successful flight simulator Kickstarter fund-raising drive in history, as a result, the museum did not have to purchase the simulator. Rafaela threw a pie in my face at a party celebrating the victorious campaign.